This user may have left Wikipedia. Taylor Trescott has not edited Wikipedia since December 2017. As a result, any requests made here may not receive a response. If you are seeking assistance, you may need to approach someone else. Sturmvogel_66 (submissions) led round 1 with 601 points in 2013. 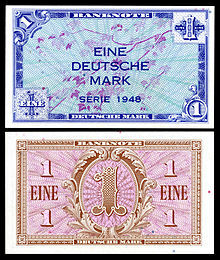 Godot13 (submissions) (FP bonus points) worked up a number of Featured Pictures during round 1, including the 1948 one Deutsche Mark (pictured right), receiving the maximum bonus due to the number of Wikis that the related article appears in. You may also wish to know that The Core Contest is running through the month of March. Head there for further details - they even have actual prizes! Thanks for your assistance! Miyagawa (talk) on behalf of Wikipedia:WikiCup. A discussion is taking place as to whether the article Cody Martin is suitable for inclusion in Wikipedia according to Wikipedia's policies and guidelines or whether it should be deleted. The article will be discussed at Wikipedia:Articles for deletion/Cody Martin (2nd nomination) until a consensus is reached, and anyone is welcome to contribute to the discussion. The nomination will explain the policies and guidelines which are of concern. The discussion focuses on high-quality evidence and our policies and guidelines. The other day I was searching for Jerry Prinz- (Leroy Jr) who I hadn't seen in so many years- he was 2 years older than I and we were friends from the time he was 6 and I, 4. His dad actually taught me how to ride a bike! Leroy Sr was a tough man- he seemed like a giant to me when I was that age, but he was only 5' 5". Jerry had emotional/mental problems and his dad was very tough on him. I remember when he once picked him up by his ears! Also, although I and another friend were tomboys, at times his dad would forbid him to play with us because we were girls- heck, Barbara was tougher than most boys! When I went to visit him many years ago, his father was there- I remember talking to him about when Jerry and I were children and even mentioned how he'd treated him he tried to explain to me that he was worried about Jerry and tried to toughen him up- which, of course, had the opposite effect. Poor Jerry- so very different from his father- the last thing Prinz wanted was a gentle son. So now you know that Prinz, indeed, had a kid. I thought he'd had a sister- maybe she was a half-sister? I never met her. I didn't know his dad had been married more than once- just saw on Imbd I think it was that he had been married 3 times (maybe Wikipedia?). To opt-out or sign up to receive future editions of this newsletter, click here to update the distribution list. Hello, Taylor Trescott. Voting in the 2017 Arbitration Committee elections is now open until 23.59 on Sunday, 10 December. All users who registered an account before Saturday, 28 October 2017, made at least 150 mainspace edits before Wednesday, 1 November 2017 and are not currently blocked are eligible to vote. Users with alternate accounts may only vote once. Thanks for uploading File:SportsReference.png. The image description page currently specifies that the image is non-free and may only be used on Wikipedia under a claim of fair use. However, the image is currently not used in any articles on Wikipedia. If the image was previously in an article, please go to the article and see why it was removed. You may add it back if you think that that will be useful. However, please note that images for which a replacement could be created are not acceptable for use on Wikipedia (see our policy for non-free media). Hello, Taylor Trescott. Voting in the 2018 Arbitration Committee elections is now open until 23.59 on Sunday, 3 December. All users who registered an account before Sunday, 28 October 2018, made at least 150 mainspace edits before Thursday, 1 November 2018 and are not currently blocked are eligible to vote. Users with alternate accounts may only vote once. Return to the user page of "Taylor Trescott".